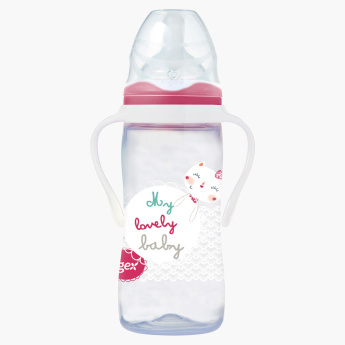 Tigex Feeding Bottle with Handles - 300 ml | Pink | Wide neck bottles helps baby easy to latch-on. Pick this attractive bottle for your little daughter to help her in the transition from nursing to bottle feeding. It gives independence to your darling and while the design of the bottle ensures spill-free experience. Furthermore, the handles of the bottle make it easy to be held by your child's tiny hands.